Tomorrow is the first day of school. There is a lot of excitment in the air. The picture above is Trey's lunch. 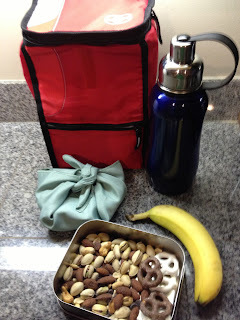 He packed a sandwich wrapped in a cloth napkin, LunchBot with trailmix and dessert, fruit and a water bottle. Simple, filling and zero waste.